Buy three, get one FREE sale! Offer Details: Buy three packs of select Designer Series Paper and get one for free! Orders may be placed on any type of order (demonstrator, workshop, customer, or online). Check out our Designer Series Papers in the annual catalog pages 151, 153, and 154. Which packs will you get? Hmm, I will have to peruse the catalog to make my final decision, but one thing for sure, I will be stocking up! 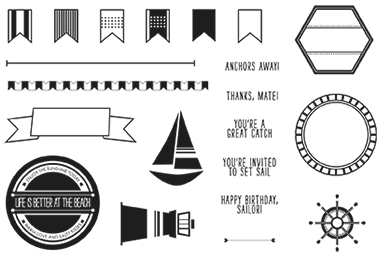 Take a look at the new nautical stamp set, Mackie and I have really wanted a nautical set, her this and that journal is all about sailing! A brand-new photopolymer stamp set is now available. Settin' Sail (item 133453) is great for vacation memory-keeping, nautical parties, or summer fun. Pick it up at my ONLINE STORE today. Thanks so much for stopping by today, I hope you were inspired, enjoy!